Every once in a while you have to stop yourself and wonder out loud, “what in the xxxx is going on here?” We’ve watched the proliferation of UAVs in recent years, especially at the personal level, sparked in no small measure by Amazon and others who are bound and determined to make our lives better in every way (not to mention their bottom line) through the use of UAVs. Five million small UAVs were sold into the North American Christmas market this past year and where they are at this very moment is anybody’s guess. I’m thinking many of these Christmas presents have already been consigned to the slag heap of Christmas presents past, when joy turns to dismay once the realization sinks in that they require direct human input which requires more than a bit of talent coupled with hard work. On the terrestrial side of things, recently the push has been towards developing driverless automobiles, with the ultimate goal to remove human input from the “driving experience” altogether. And that’s no driver input whatsoever, like that dystopian view of the industrialized robotic factory of the future. It’s a building full of robots, with one man and a dog. The man is there to feed the dog and the dog is there to prevent the machine from touching the machines. 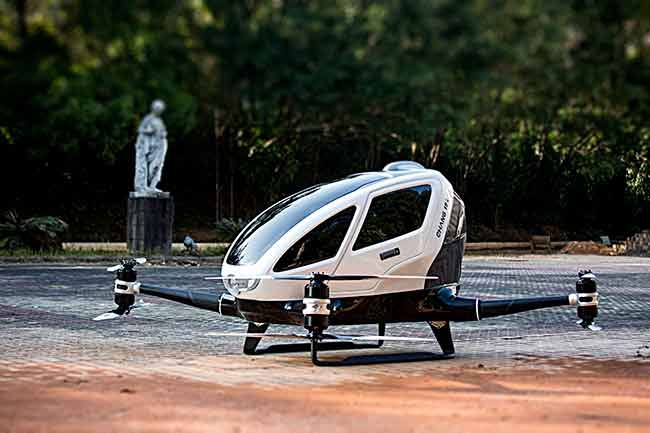 At this year’s Consumer Electronics Show in Las Vegas, Ehang, a Chinese company, introduced the Ehang 184, a UAV capable of carrying a passenger. I guess it’s not actually a UAV, because it’s not “unmanned,” but I’ll leave it to someone else to create a more accurate pigeonhole. The name “184” is derived from “one passenger, eight propellers, four arms.” It’s a quadcopter with 110-hp under the hood. Passengers up to 100 kilos (that leaves me out) can be transported to an elevation of 3,000 metres at speeds up to 100 km-h, limited only by the 23 minutes of go-go juice. Look at the world of the driverless car and you can gain some insight into what the future might be for autonomous aircraft. Google has taken the lion’s share of the attention with its little jelly-bean cars, but they are only one of a number of companies in the race – companies with very deep pockets that are quite prepared to spend enormous sums in the pursuit. The State of California is developing regulations regarding the care and feeding of autonomous vehicles and requires companies to file reports on their work, miles driven, etc. and most importantly, the number of “accidents” their test cars have been involved in, as well as the number of times the software has dictated that the caretaker human onboard take over. It should be noted that these handovers aren’t like the good old days when your father might pull over on a back road and say that it was time for you to try driving. Oh no, when the computer hands off or “disengages” in favour of the resident human, it will be in mid-stream and RIGHT NOW! Which brings us back to the world of commercial aviation and several disasters in the past decade that have resulted from a disconnect at the human-machine interface. When the machine (autopilot) encountered a situation outside its programmed capabilities and handed things off to the human side of the partnership, the situation was what rugby players used to call a hospital pass, because very little good would come of it. The research that has gone into developing autonomous automobiles is slowly starting to come to light. It’s all about processing information and then making decisions, the best or most appropriate information based on time and circumstances. A lot of this research could be used on the aviation side as well, such as the human factors and especially the human-machine interface. Success in the quest for the driverless car comes when the there is no driver, just passengers – as long as they have a place up front for the dog.